Among the mysteries of the Universe that are able to be investigated by science, the possibility of extraterrestrial intelligence remains one of the most fascinating. Ancient cultures around the globe have already speculated on that possibility, but we may now finally have the right tools to conduct serious research. Probably the best example of this present-day capability is the Search for Extraterrestrial Intelligence (SETI) Program, which aims to detect electromagnetic signals of extraterrestrial technological communication. Another is the Search for Extraterrestrial Artifacts (SETA), which looks for space probes or stellar-energy orbital plants (so-called "Dyson spheres"). Finding an unmistakable sign of alien technology would be evidence for alien intelligence, even if we never found any living species. Scientists agree that even though the discovery of an alien civilization is an event of low probability, if it ever happens it would have deep social, political, religious, intellectual and scientific consequences. But can we quantify the severity of such an event? Can we compare the effects of different alien contact situations? Aiming to quantify and compare events, scales are a familiar scientific tool. For instance, scales such as Celsius, Fahrenheit or Kelvin are used to quantify temperature. 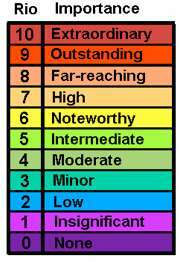 The Beaufort scale expresses the strength of storms by wind speed, while the Saffir-Simpson scale classifies the power of hurricanes and Fujita does the same for tornadoes. Iván Almár from Konkoly Observatory in Budapest, Hungary and Jill Tarter from the SETI Institute in California developed a similar scale to quantify the potential significance of any announcement of the discovery of extraterrestrial intelligence. Their scale was initially presented at the 51st International Astronautical Congress, 29th Review Meeting on the Search for Extraterrestrial Intelligence, in October 2000. The event was hosted in Rio de Janeiro, Brazil, so it was called the Rio Scale. The actual scientific paper was published in 2011 in Acta Astronautica. Later that year, another paper by Almár and Margaret Race from the SETI Institute reported in the Philosophical Transactions of the Royal Society a few improvements on the Rio Scale, after thorough discussions within the scientific community during the last decade. The Rio Scale is somewhat similar to the two-dimensional Torino Scale published in 1997, which quantifies the consequences of an encounter with an approaching asteroid. The Torino Scale takes into account the potential damage of an asteroid impact and the probability of its collision with the Earth. It was the first attempt to combine on an ordinal scale the effects of two equally important parameters, resulting in a range of 0 (no hazard for mankind) to 10 (certain collision inducing global catastrophe). Where Q is an estimated level of consequences obtained from the sum of three parameters: class, discovery type and distance of the phenomenon, δ represents the discovery credibility, a more subjective factor likely to vary with time. High values always represent potentially more important consequences. In the table shown below, the Rio Scale has a value for each of the three categories of Q, which have a number ranging from 3 to 15. The estimated reliability of the claimed discovery, δ, has five possible values and it may decrease or increase with time and among different observers. A claim verified by many experts in multiple and unrelated ways is a case of δ = 4/6. An unequivocal fake signal means δ = 0. The product of Q and δ is the potential effect on humankind of an announcement of the discovery of an extraterrestrial intelligence. It ranges from 0 to 10 (for eleven levels total). The difference between the class of "Earth-specific" versus "omni-directional" messages indicates whether the extraterrestrial intelligence knows about our planet Earth. While SETI and SETA aim to hunt for signals of aliens, other observations may include serendipitous detections made inadvertently (more likely by astronomers). 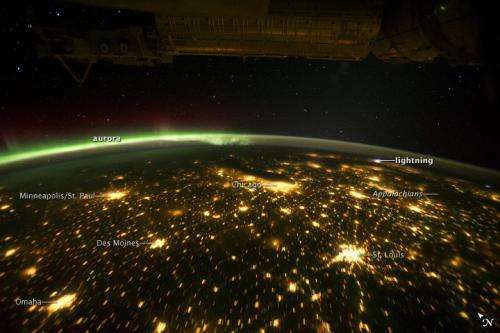 For the classes "leakage" and "astroengineering," the former means electromagnetic radiation that escapes out into space, while the latter means any other kind of technological activity. Transient phenomena are those verified once but never repeated, while steady phenomena can be verified by repeated observation or investigation. Re-evaluation of archival data would come from old collections of data, and such accounts may be hard to verify. The 50 light-years distance is an arbitrary distance to allow round-trip communication through the speed of light during a human lifetime. Even when we face an event of possible huge consequences (high Q value), if the claim of detecting an extraterrestrial civilization is not credible (low δ value), this will drop the actual significance of the discovery. Iván Almár and Jill Tarter noted "the discovery of extraterrestrial intelligence as a high-consequence, low-probability event" and suggested their Rio Scale could be used by the media as a tool to avoid misinterpretation and sensationalism over claims about extraterrestrial intelligences. 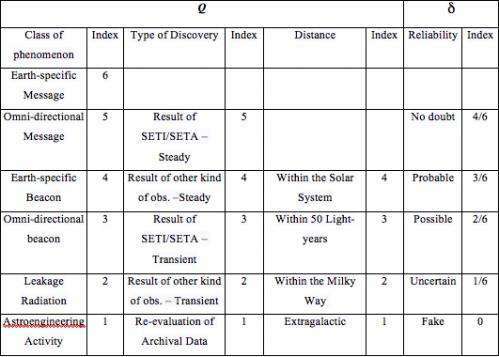 It will be the task of a group of independent experts to calculate the Rio Scale index for any putative discovery. And least likely to find, yet it won't stop the sci-fi community from invading science. This might be the first time I actually agree with you cantdrive. This story is almost hillarious. We don't have a single credible instance of extraterrestrial intelligence being detected, but we need a classification system to classify instances?????? Ummmm, how about waiting until there's like more than one, then worry about classification. Until there's more than one, the only classification needed is "the event". Imagine a tribe in Brazil protected by international law from from outside influence. That tribe will evolve naturally. Now imagine one of the members of the tribe is sent out into the world to see whats out there and report back. The international law would no longer matter. The tribe would be, for the most part open game to the good and bad of society at large. We may regret sending those probes out there.